Baseball is a sport that can be beautifully captured on television, or made so awfully boring that it loses almost all that makes it a great game. Baseball on television with bad commentators can be about as interesting as, well, listening to those bad announcers without the baseball game. Great television and radio commentators are rare. The great ones exist. Bob Uecker. Harry Carray. Jon Miller. Red Barber. Jack Buck. These great announcers are able to bring fans into the ballpark. They can successfully describe all the details of the game without sounding like a yipping puppy. Historically baseball has been a great game for radio. It is certainly better on radio than football or basketball, both of which are very difficult to follow even with a great broadcaster. Baseball is a sport with a lot of dead time. 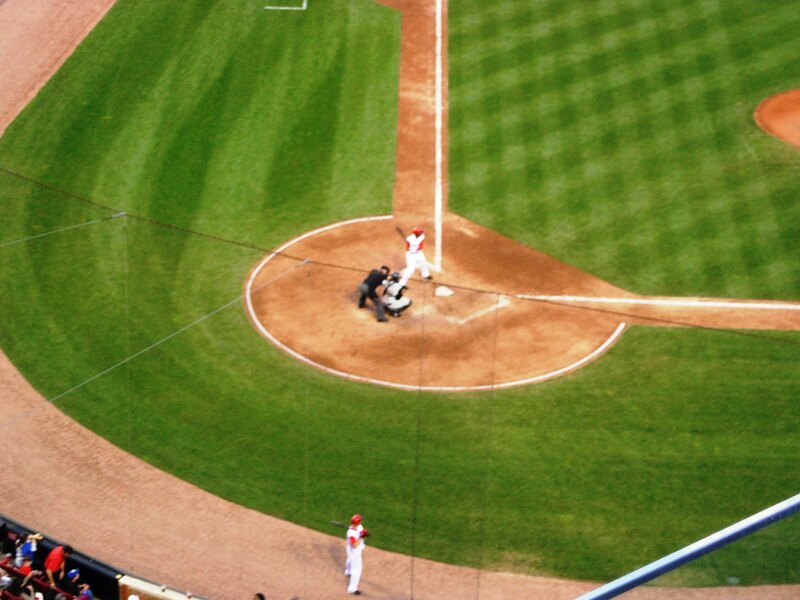 At the ballpark there are diversions and movements that keep a fan's interest during the space with no game action. I have always enjoyed the betting game at the end of the inning when the pitcher tosses the ball back toward the mound as he runs to his team's dugout. Some pitchers are great at getting the ball to stay on the mound. For some, it almost always rolls off. When I keep a scorecard I try to mark how often the ball stays on the mound. That one isn't very exciting but does provide something to talk about between innings. Between pitches the outfielders shift, the pitcher takes signals, batters go through their routine of shaking the bat or adjusting their gloves. Sometimes there are pitchers in the bullpen. And no matter the park there is always something interesting going on in the stand, be it a beach ball, the wave, a vendor that thinks he's Jay Leno or even a fight. But on radio, or even on television, fans don't get to see the intricacies of baseball. It's usually up to the broadcaster to keep the descriptions lively and keep the listener entertained. It's almost like taking 30 pages of real material and trying to dress them up into a 100-page book. If those 70 extra pages are written well, the book can become far more interesting than the almanac it started as. But if these extra pages are stuffed with obnoxious descriptions of every pebble or if they are left with big blank spots the book can be just as monotonous as the 30 pages we started with, only thrice as long. In addition to its lack of continuous action, baseball on the radio has another challenge that football and basketball don't face. It's a season with over ten times as many games as the NFL season. Most games mean little more than a notch in the standings equivalent to 6/10 of one point of a team's final winning percentage. So while a football game on radio can capture a fan's interest because of the sheer importance of the game, baseball most of the time won't. Again, it's the broadcaster's job to make the game worth listening to. And again, with 162 games, if he makes each sound too exciting, the fans will get tired of listening. I've always been impressed with the ability of some announcers to tell interesting stories that have very close relation to the situation at hand and a batter for whom they might not know more than a name, a number, a position and a birthday. Broadcasters become part of a baseball team's image. Famous phrases like Marty Brenneman's "And this one belongs to the Reds" can symbolize a team for thousands of fans. Every broadcaster has his own calls for a pitcher's windup, a home run and a home team victory. In Philadelphia they have marks in the win column for the "Fightin' Phils." And in New York, "thhhhhheeeeeeeee Yankees win!" And every radio and television station has its sponsors for different events in the game like calls to the bullpen presented by the local phone company or relief stats presented by a heartburn medication. And because anymore announcers usually come in pairs, one as the play-by-play guy and one as the "color commentator," the two have to interact well. Famous Cubs' broadcaster Harry Carray was such a show himself that is would have been easy for him to overwhelm anybody working with him, but Carray often took time out to tease partner Steve Stone for giving up the only home run Cleveland second baseman Duane Kuiper hit in his entire nearly 3,400-at bat career. All these trademarks are part of the ballpark experience. Not all fans have the time or money to actually make their way to the park, so the broadcasters must bring the park to them. For the fans in the car or in their living room what they know from the ballpark may be only what they see on television or the calls they hear on the radio. A great announcer can bring his broadcasts as many unique features as in the ballparks themselves.